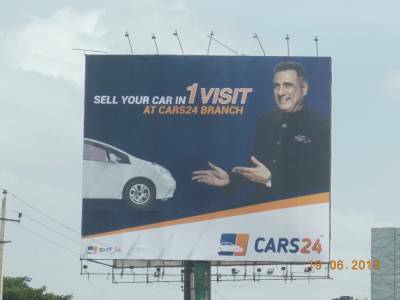 Milestone Brandcom, the out-of-home agency from Dentsu Aegis Network, has rolled out a massive OOH campaign for Cars24, a platform that makes selling of second-hand cars an easy, fair and a quick experience. Currently launched in Bangalore, the campaign focusses on inviting customers to sell their cars at the city’s Cars24 branch in their very first visit. The campaign is based on the insight that, in the current times, the selling of second-hand cars in India is an extremely complex process. In this market, car owners have to visit or meet a number of buyers before making that sale; and Cars24, a focused and specialised player in this domain, intends to make this technique easy with its unique process that allows the sellers to get the right price for their cars in their very first visit. Spread across a massive area of more than 70,000 square feet, the OOH campaign encompasses large format billboards, bus shelters, buses, unipoles and gantry. With an aim to design a successful campaign, Milestone Brandcom has selected strategic locations including arterial routes, corporate areas, market areas, and motor garage to reach out to the brand’s core TG. “It’s a delight to witness such an outstanding response to this campaign. The planning of each site was done using detailed understanding of the city’s traffic pattern and showroom locations. Each site that has been chosen is a high-impact zone, ensuring maximum visibility. The innovation has already generated extensive exposure and significant buzz,” he added.